1. In 2004, Eileen Myles gives a talk called “Everyday Barf.” I know nothing of this. One of these lectures I have the opportunity to attend. It is scheduled for 8:30 a.m.; it is winter in Chicago; it is snowing. I sleep in. 4. Reading Bellamy’s response to “Everyday Barf,” I realize I own a copy of Sorry, Tree, the collection of Myles’ poetry in which “Everyday Barf” appears. I own this book by accident because I won it in a raffle. I read “Everyday Barf” and the rest of the collection, which I’ve since lent to a friend who needs to give it back to me; am bolstered by the reminder that Myles exists in my world and lifetime. 7. Shortly thereafter, I chance upon Kate Zambreno’s blog, find her doing the same sort of thing! 8. Am initially crestfallen, like knife to heart, betrayed by shattered unreasonable hopes/illusions/etc, then realize no, I have never been original; there is an answer, which is to bring Kate Zambreno into the essay, particularly her v. fascinating thoughts on bulimic versus anorexic writing. 9. Begin internet-stalking Kate Zambreno. Turns out we attended many of the same panels at &NOW and probably sat in the same row at the Gurlesque panel (though on opposite sides of the room). Turns out she lived in Chicago while I also lived in Chicago. Turns out like MISSED CONNECTION. One day, Kate Zambreno, we will together spew. 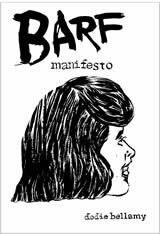 BARF BARF MANIFESTO MANIFESTO (working title) forthcoming, Mildred Pierce Issue 4, release date possibly May 2010.